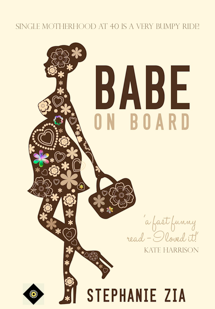 Normally for my reviews, I stick to books set in France, but I follow Stephanie’s blog and she was looking for bloggers to read and review Babe on Board for her. As one of the characters is a Frenchman, all be it away from his homeland - but you know you can take the Frenchman out of France, but not France out of the Frenchman, I let myself get carried off to Kew in London. This is a gentle story that is set in a beautiful place; I love Kew and have enjoyed many days out at Kew Gardens and Stephanie does a great job at bringing the place to life. The story follows Molly, a first time Mum in her early 40’s, single but with more ‘complications’ than most, as she makes the transition from working traveller to being a new Mum with a new life; a new area, a new baby, new friends and possibly a new man. I really felt for her when she realised she was moving on and away from her friends and I’m sure any Mum will relate to Molly. Stephanie is spot on describing relationships, and shows they can be anything but straightforward, and that what goes on behind closed doors isn’t always what it seems. She certainly covers feelings incredibly well, which really brings the characters to life, and touches on pretty much every relationship there is including, strained ones, forbidden ones, new ones and changing ones. Christophe’s character was perfect, by rights I should have hated him or at least been cross with him for the trouble he caused and the mess he made in their lives, but no, he is a passionate Frenchman and you can’t fail to love him for it. The way he seduces with talk of his passion for perfume, I’m surprised not to have heard him mutter in his heavy French accent the word ‘terroir’ – that all important French word that has no direct translation to English. If the time of day to harvest his precious flowers has so much influence I’m sure the soil type/location does too. I thoroughly enjoyed this book and found myself so engrossed in the characters that snippets of it would pop into my head during the day when I wasn’t reading, which is always a sign of a good book. Happy reading ladies - it probably won’t appeal to the gentlemen.